Join Us at the HRSouthwest Conference October 17-18 | Challenger, Gray & Christmas, Inc.
We are pleased to announce that from October 17-18, we will exhibit at The HRSouthwest Conference (HRSWC), the premier regional educational and networking event for HR professionals. Nearly 2,000 HR professionals are expected to attend HRSWC to learn from more than 100 subject matter experts and discover new solutions and services for their business challenges. HRSWC offers learning opportunities and educational options designed to provide HR professionals and those who serve the industry, tools to succeed in their professional roles. The Marketplace at HRSWC will showcase solutions and services represented by exhibitors in areas including Compensation & Benefits, Employee Relations & Labor Relations, Global HR, Health, Wellness & Safety, HRM Programs and Services, Professional Development, Talent Management and Technology. 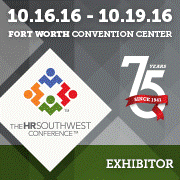 The HRSouthwest Conference is the premier regional human resources event in the United States and the State of Texas SHRM Conference. HRSWC provides more than 100 educational sessions from thought-leading speakers, numerous networking events and an exciting Marketplace of more than 200 HR solutions and services providers. The Conference will be celebrating its 75th anniversary, Oct. 16 – 19, 2016. More information can be found at hrsouthwest.com.